Monday: Jill Lynn brought us a great post on editing tips! Wednesday: We celebrated Christmas in July, discussing the essentials of a good Christmas story with Mindy Obenhaus. Winners of her holiday book, The Deputy's Holiday Family are: MJSH, Lila Diller and DebH. Congratulations to all! Friday: Our gift to you was editing and critique help from The Seekers... who truly want your success, smiles and courage as you launch yourselves as publishing's businesswomen of tomorrow... playing with us, today! Thanks for being brave enough to jump in the pond and swim with us! Monday: Mary Connealy will be here talking about the brave new world of indy publishing!!! And giving away an ebook copy of BOTH of her newly released romantic suspense novels!!! 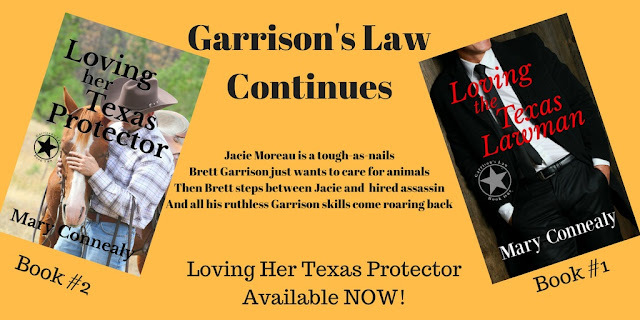 Loving the Texas Lawman and Loving Her Texas Protector. Wednesday: Ruth Logan Herne is here on Wednesday with a timely post about procrastinating and why one should never, ever do it. She hasn't written the post yet, because she's been lollygagging at the shore, toes in the water... but she'll get around to it. Eventually! And she might have something to throw into the prize box if she catches up with her way behind mailings!!!! Friday: Beth Erin from Faithfully Bookish is in the house on Friday! 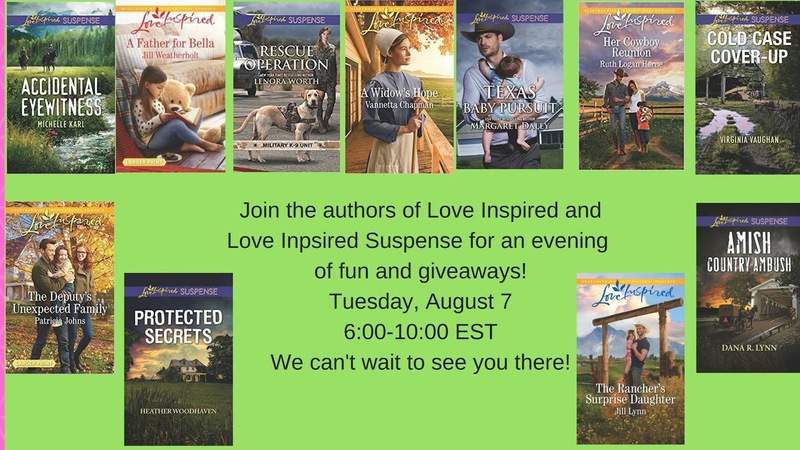 FACEBOOK LAUNCH PARTY FOR AUGUST LOVE INSPIRED BOOKS!!!! TUESDAY 6 to 10 on FACEBOOK!!! 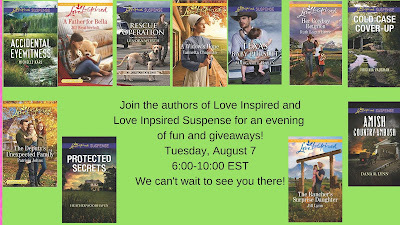 Love Inspired August Launch Party on Facebook!!! KINDLE VERSION JUST RELEASED!!! Ruthy may have bumped her friend Mary down a notch... sorry, Mary! 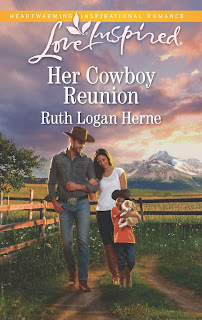 The Kindle version of "Her Cowboy Reunion" released on August 1... 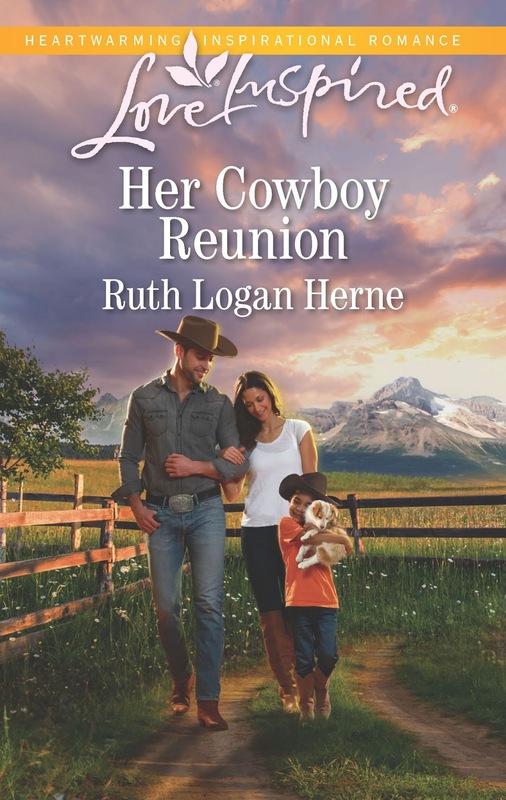 If Kindle is your fave way of reading a great story, grab this one... Click on that title above and then tell us if you love this book as much as Ruthy thinks you will! And here's a great review on "Diversity Between the Pages" by our own Meez Carrie! Link to Carrie's lovely review! Book Two is OUT and now available as an ebook and a paperback. And I will be talking about them on Monday!!! And giving away an ebook copy of EACH on Monday. 10 Top Book Marketing Takeaways from RWA 2018 by Diana Urban from BookBub Partners. Publisher Questions: What to Ask Before You Sign a Book Contract by Tim Grahl from Book Launch. Congratulations to the winners! Happy Weekend Seekerville! Just when I thought I couldn't love you more!!!! Man... I knew I should have stopped by this morning. Caryl, I love English Breakfast, especially in a china cup and with good company. Hope everything went well with the hands-on Friday. I didn't participate after all, it would have been One More Thing, but I'll be on board for the next one. This is going to be a great week with both Ruthy and Mary posting. Happy Saturday, everyone! And congratulations to the winners! I agree, Kathy. Next week sounds like a winner! We are so very blessed. What a warm, wonderful, just plain nice group. Waving to everyone and sending congrats to last week's winners! More rain expected in GA. We are soaked. Wish we could send some of the moisture to CA and CO! Enjoy the book, Kav, and know how grateful we are for your support and friendship! Hugs! I've been on the borrower side of this, Kav and it is so guilt inducing!!! THis past week in Seekerville was so good. I read each day, but life's been a little crazy hard in Takenaka-land. So, I didn't get to comment. I even knew what I wanted to share yesterday, but never got the chance to post it. Sigh. I love how so many Seeker ladies chimed in. What great feedback you offered! Thnaks for the WE and the links. I'm looking forward to checking them out. Have a great weekend everyone! We plan to offer the critiques again, Jeanne. Stay tuned! That was fun, wasn't it???? Happy weekend, Seekerville and congratulations to all the winners! Wishing you a joyous Sunday, Wilani! Thanks, Wilani! I just sent out a book to you... which means I've caught up on my mailing!!!! Many thanks for the WE with links and for Ruthy's critique of my first para. Unable to get back here until Sat. to reply expressing my appreciation. Congrats to all winners. It's still hotter than usual here in Philly but thankful that we had rain again yesterday. My angel's trumpet is ahead of schedule due to heat and rain. Soon its gorgeous and fragrant flowers will appear. A blessed Sunday to all. Oh, that's gorgeous!!!! What color is yours? Definitely a Southern planting, nothing we could do up here. I love it, Pat! Happy Weekend, everyone. Hope it was good for all. I went to Kansas City for an overnight trip with my husband and son for a little getaway. We visited the World War I museum there. Very moving. Also ate good Kansas City BBQ. Last weekend we took a day trip out to western Nebraska and visited Ft. Sidney and Boot Hill cemetery. That would be a great place for historical writers to get ideas for sure. Well, I'm REALLY late, but I wanted to stop by to say hello. And I hope you had a great weekend! I look forward to this week's posts.